Born in Shropshire in 1848, Matthew Webb ran away to sea when he was a boy. He eventually became captain of a trading ship operating in the English channel. 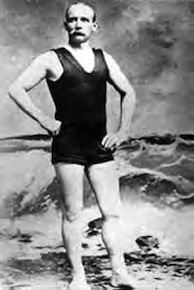 On 24 August 1875, Captain Webb became the first person to swim from England to France. He stepped into the waters at Dover and arrived in Calais 21 hours later. This feat not only attracted huge public attention it also earned him £15,000 prize money. The accomplishment led to Webb participating in regular long distance swimming events firstly in the UK and then then in the USA. Looking for a new challenge, he decided to attempt to swim the Niagara River which had never been done. On 24 July 1883, in front of a crowd of 1000 onlookers Webb began entered the water just above the 'whirlpool rapids' one of the most ferocious stretches of water in the world. A few minutes after entering the rapids the crowds lost sight of him. Search parties scouted the river banks until night fall but it was another four days before his body was found over a mile down river. He was taken to the nearby Oakwood Cemetery next to the Niagara Falls where was buried. "Until I visited the falls I could not understand why anyone would want to attempt something so foolish, but it is only when you stand on the edge and feel the power of the millions of tonnes of water thundering over the cliffs do you appreciate the magic of falls and why people have been drawn to challenge this immense feat of nature."